If you want to learn basic to intermediate Spanish and/or English communication skills try our Spanglish Workbook Course. Written in both languages in easy to read columns, it focuses on the similarities between Spanish and English. 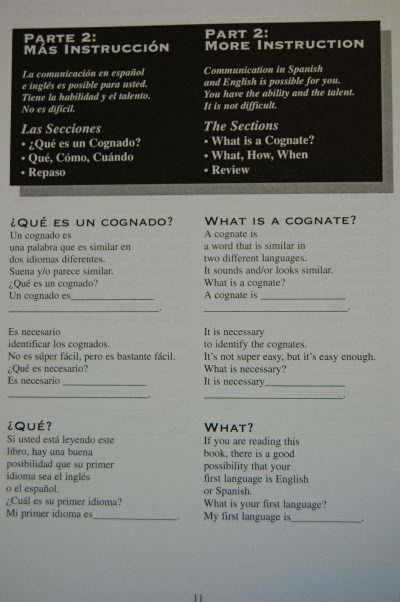 By using words called cognates, similar in spelling and sound in both English and Spanish, this innovative concept gives you a foundation in learning your new conversational skills. The Spanglish Workbook is not a typical “learn the language” book. It takes you through repetitive steps that increase the user’s ability to absorb and actually learn the language. The Spanglish Workbook is recommended for people who have never taken a language class up to intermediate learners. Programs are available for advanced learners.